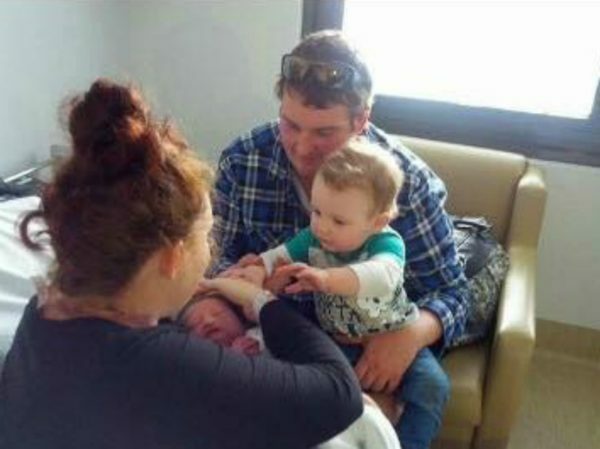 “A speeding ticket will be the least of your worries!” That’s what 28-year-old labouring mum, Kirralee Morgan, said to her husband on the way to the hospital when she felt the urge to push. Little did she know that no amount of speeding was going to stop baby Cooper from entering the world before they got to the hospital. As told to Babyology by Kirralee Morgan. We actually didn’t find out we were pregnant until about four months along and were told we were expecting another boy. It was my second pregnancy, having had our son Oliver only about six or seven months before. Both were smooth pregnancies, although with Ollie I found out I had pre-eclampsia at 36 weeks and was induced early. After that I thought I was for anything with my second pregnancy but I never expected what actually happened. Wade was in a bit of a shock but the bed was saturated so we had to get up. I knew what was happening and rang the hospital. They told me that my contractions wouldn’t start for another four to six hours so to go and have a warm shower, try and get a good night’s sleep and then call them again in the morning. This was at 9.20pm. Meanwhile I couldn’t get hold of my mum. I tried to phone her literally 27 times but she was up in the Gold Coast for a work function. She’d said to me before she left, “You can have him any day except for Friday because I won’t be able to get there because of work.” The day of course was Friday and my husband kept trying to call her without success. Two minutes after I got into the shower, as advised, I had a big contraction. My husband helped me out and get dressed. We rang his mum who rushed over within 10 minutes as she said it sounded like my labour had started. After she arrived to watch Ollie and watched me have another contraction in the hallway she rushed us out the door, aware that our local hospital was a 40 minute drive away from our home in Woodburn, NSW. We’d not driven very far when I told Wade that I didn’t think I could give birth without any pain relief. I’d had an epidural with my firstborn and couldn’t imagine going without. But he reassured me I’d be fine and that I would just do what I needed to do when the time came. Not long after, I felt the urge to push start to build. We just weren’t getting to the hospital fast enough for my liking and Wade was driving like it was a Sunday and not a rush against the clock to get his wife to hospital to deliver our baby. I told him to put his foot down and go for it but he was too worried about getting a speeding ticket. “A speeding ticket will be the least of your worries if you don’t hurry up,” I warned. Finally he went a bit faster but after I told him I needed to push again he said to call the midwife. The midwife told me over the phone that I would feel the urge but to try not to push but instead breathe through it. I was already screaming at this stage and my husband was in the background trying to to get me to ask a bunch of questions. I swear if looks could kill, he would have dropped dead right there. It was now 9.45pm. Things happened really quickly from there. I pushed a bit and realised my son’s head was out. It took us a while to find somewhere to pull over and I told Wade to come and investigate. He was not keen at all and was completely freaking out but managed to help me get my pants off to check the situation. “Oh, he’s here,” was Wade’s panicked response. After taking off my PJs and seeing Cooper already out to his belly, it only took another five or so minutes before he was completely out. Surprisingly I wasn’t scared at all, but instead started laughing hysterically. I was just beside myself! By this point Wade wasn’t sure what to do next and phoned the midwife again who told him to make sure Cooper was completely delivered and to check the cord wasn’t around his neck. I took off my shirt and we placed him in that, he was still attached to the placenta by the umbilical cord. Five seconds later I started to cry. The emergency medical dispatcher was trying to get all the details she needed to direct the ambulance to us but it was dark and Wade had to walk until he could find a street sign. I was in the car with Cooper and nothing else mattered at that stage. When the ambulance arrived 10 minutes later I do recall saying to the male paramedic not to judge me but he said “Darlin’, I’ve seen all this before.” They were amazing and thankfully Cooper was perfectly healthy and he just needed a bit of oxygen on the way to the hospital. Wade was following in the car when he got a call from my mum who was shocked to find out that I’d not only gone into labour, but that my new baby boy had arrived before I could get to the hospital. My previous labour with Oliver had taken around 14 hours so this speedy birth was a surprise to all of us. My poor mum was so panicked she got a friend to drive her to meet the ambulance and she even ended up helping them by holding a torch while I got stitched up. “You just couldn’t wait, could you?” she said. Apart from needing the initial dose of oxygen and a lot of bruising on his face, Cooper was completely fine. The birth had been quite traumatic for him because I was sitting in the car during the delivery. Amazingly, I didn’t need to worry about needing that pain relief after all, as I didn’t feel a thing! It must have been all the adrenaline and the distraction of trying to get to the hospital in time. Needless to say, word of Cooper’s incredible birth spread throughout the hospital and all the midwives wanted to meet our little boy over the next few days. 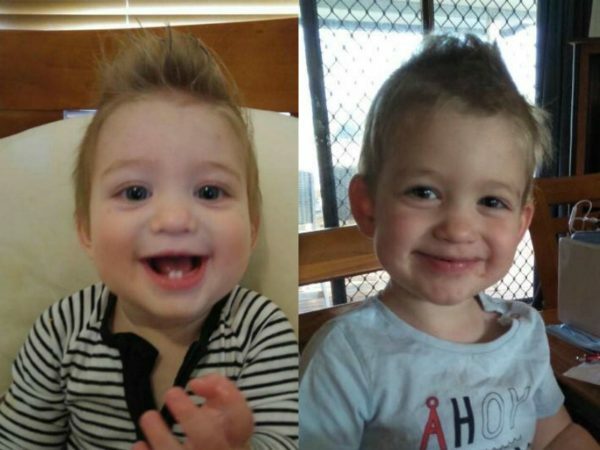 Despite a few other unrelated health complications that he had following the birth, Cooper, who is now two (pictured above) is such a busy little boy. He’s always in a hurry and runs everywhere after his three-year-old brother so it’s no surprise he wanted to make such a speedy entrance into the world. Unlike myself, my husband Wade is still quite traumatised from the birth. But even though I love telling the story, one thing’s for sure, if we do ever end up having another baby I know I’ll definitely be getting to the hospital a lot earlier next time!